I've always fancied having stripped, non hirsute trunked Trachycarpus palms in the garden but somehow we have never managed to have any. Nor had we the chance to do some palm stripping ourselves despite actually knowing how to do it. All theory, no practise and that's no good! Take it all off baby! So we decided to end such an omission by finally giving a 'full Brazilian' to a decent sized trunked Trachycarpus wagnerianus this weekend. Turns out that trunk stripping is a more common practise than I first perceived it to be and those who have had stripped ones for many years in the UK have reported that they have not noticed any difference to the hardiness nor vigour and health of the palm compared to those that were left as they were. Which means you get to have another option on what 'look' to go for, hairy or bare without adversely affecting the health of the palm. But, more importantly do we actually like the way it looks? Again, when I first saw one, with a creamy white trunk and looking alarmingly more slender than what I was accustomed to I wasn't sure if I liked it. Gaz however liked it from the very beginning. However, when I saw one in the flesh that had been stripped for quite some time and the trunk looking brown all over I loved it and was eventually converted! So fast forward to the present and we finally managed to do some stripping! So how do you go about doing it and what tools and materials do you need? First, you need a specimen that has a decent length of trunk. The taller the better! Too short and you won't appreciate the distinctive appearance of a bare trunk and it will just look squat. Small and a juvenile specimens are a no go, there's no trunk to expose to begin with and even if there is an inch or more of trunk forming that's still too little to expose and you might end up harming the plant when slicing the fibres off. As for the tools, all you need really is a sharp cutting or Stanley knife and that's about it! A pair of sharp scissors might come in handy though to remove some finer hairs and smooth off the trunk afterwards. A sharp cutting knife is essential. And you'll need a large bin too, to place all of the fibres you will be removing from the trunk. Bin or keep? You can perhaps come up with a creative or functional use for these fibres. Begin from the base and remove as much of the loose fibres as you can by hand. You may find that some of the fibres are coming off on their own already with very little effort, exposing the slender bare trunk underneath. That's how it is anyway au naturel, eventually fibres start to come off on their own starting from the bottom and gradually upwards for specimens left to their own devices after many, many years. Then, once you have removed as much as you can by hand, use the cutting knife to remove any that are still attached until you get a smooth trunk. Work your way up, cutting on to the old leaf bases, peeling them and the fibres off which gradually exposes the trunk. You eventually reach the layer before where the leaves start. You then need to carefully remove the last layer of fibre. With the trunk bare and exposed, there's no point leaving a fluffy top so finish the job off by cutting the excess fibres where the crown of the palm is. Then go over the exposed trunk again with a pair of scissors, cutting off any stray fibres left for a smoother finish. When you first strip a palm, the trunk will probably on the whole look more on the pale side but gradually this will turn brown in the following weeks as they are left exposed. 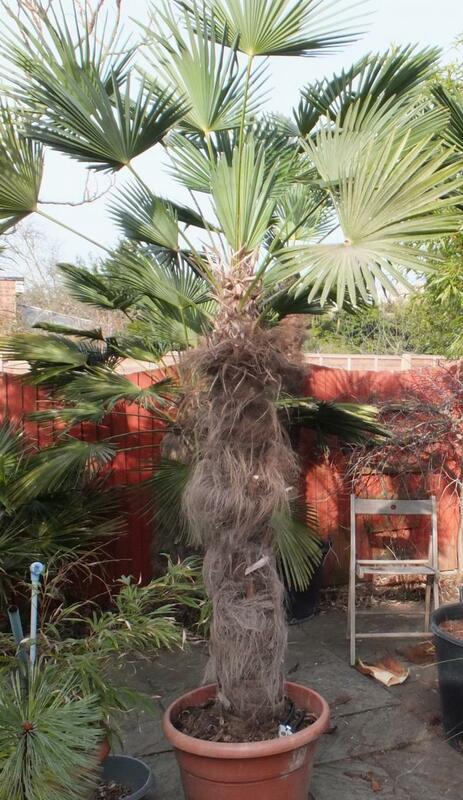 Stripping a Trachycarpus palm is one of those topics that tends to be a subject of debate for many gardeners. Good or bad? Yay or nay? Like or loathe? All a matter of preference. But I'm so glad we finally have one, we love it! It just gives this ever reliable palm a different dimension when it comes to its appearance. But we don't prefer it over the hairy, natural ones either. We like them both equally now. What about you, any preference? And would you consider having a go at stripping one yourself if you haven't done so before? I love the stripped look myself, as it makes the palm look much more tropical.I prefer to do it with trunks that won't be exposed to full sun, as I've found that the stripped trunks can retain a mottled blue and green coloration with brown ring scars that is the color of the ocean along Brazil, and will keep this color for years if not bleached away by sun. If subjected to sun, they do revert to brown. It does make the palm look more tropical which is nice. Interesting to hear about growing it in the shade and what sort of colouration you can possibly get from the trunk. Growing it in the sun doesn't seem bad either wit the brown colour which I prefer over the newly peeled, pale look which makes the palm look raw to start with. You're welcome Tom! I think it also depends on the setting and planting scheme. For a more naturalistic look a hairy trunk seems more suitable. Modern, sparse, and contemporary planting perhaps the stripped one? Either way you can't really go wrong with this palm. I like the look. Interesting process, but it looks a bit scary going after a plant with a sharp knife! Good job! I like both and your technique looks better than using a torch to burn off the fibres! It is shocking to see the difference and almost makes the plant seem less substantial at first. Thanks for sharing how you did this! Fascinating how slender the trunk really is underneath the fibres. I prefer the knife over the torch anytime, and no risk of scorch to the leaves too! Very interesting to see the process. I have to say I'm partial to the "as is" hairy look, but I think it's (as you say) just a personal preference (just like there are those that prefer a Yucca trunk with old leaves left in place). Of course what I'd really prefer most of all is to have a couple of tall palms to even consider doing this with! I like both. They look like two different species. We have a lot of bare-trunked palms and there are very few hairy ones here so I don't think I'd ever shave one though. Does it take much maintenance? They do don't they? :) Very little after maintenance at all, apart from the usual care of this palm. In time as it grows taller you'll just have to strip off a bit again but it'll only take a minute or two to do once in awhile. Never stripped one. I love them but they are not hardy here. If they were I would have a couple at least. I would have to have them stripped though, as I don't like the shaggy appearance at all. You did a fabulous job on it. Thanks Cher! Shame this palm is not hardy enough for your location. I also think the stripped looks more tropical, but I like both! I think it will also settle in and weather a bit so it doesnt look so new! great palms, are they new? were they mega bucks? I like, although I probably wouldn't do it myself. I love Dave Browns ones too they certainly look spectacular. Thanks Libby :) Try having a go at stripping one day, worth it! My vote goes to the stripped version. Aren't you glad, after going to all that work? Anyone tried sanding off the rings to leave a perfectly smooth trunk? for the brave only! I'm not sure Dave, I havent heard of anyone doing that. As the trunk is very fibrous it may not sand easily. Good grief, I really didn't think I was going to like the end result, but actually it is rather pleasing. I couldn't tell you which I prefer, from the photos, but I imagine it must be interesting touching first one and then the other form. Fascinating way to add an extra dimension to a well-known plant.